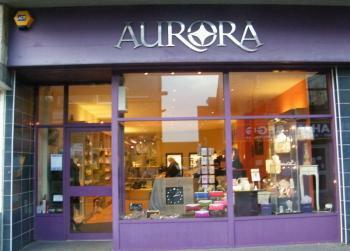 Thurso's jewellery and lifestyle store showcasing Aurora Jewellery alongside the best complimentary lifestyle goods including brands such as Liz Cox, Pilgrim, Fossil Watches, Highland Stoneware and Arran Aromatics. We also offer a comprehensive commission service for engagement and wedding rings and any other jewellery you desire. Free gift wrapping service available. Orkney jewellery designers and creators Aurora have their Thurso shop window under wraps this week as international designer Simon Costin prepares a display to mark the Royal National Mod. The world-class art director arrives in Caithness on Wednesday (6 October), fresh from Milan Fashion Week, to dress the window.